Contest winner Sarah Thigpen (left) and her father showed off her winning entry with a bus wrapped in her artwork. 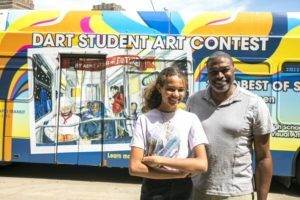 DART’s newest Student Art Contest winner, Sarah Thigpen, of Booker T. Washington High School for the Performing and Visual Arts (Dallas ISD), showed off her winning entry to fellow students with a bus wrapped in her artwork. The ninth grader’s poster was chosen as Best in Show for 2019. Thigpen received a $1,000 cash prize from Dallas Contemporary and will have her work seen on a bus throughout DART’s 13-city service area throughout the next year. The bus is the first ever to be wrapped completely in a winner’s artwork. Thigpen’s winning artwork will be shown later this year at Dallas Love Field Airport and the Courtyard Theater in Plano. Currently it is on display at the Dallas Museum of Art through April 28. The 2019 theme “My Next Stop Is ___” had 894 students from 133 schools and organizations, from kindergarten to twelfth-grade participating in the contest to help promote the use of public transportation. The work of all 2019 DART Student Art Contest grade-level winners can be seen at dart.org/artcontest.